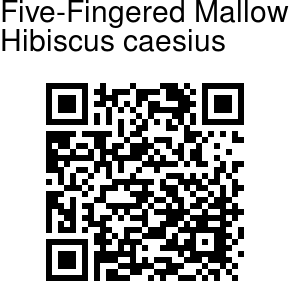 Five-Fingered Mallow is an erect herb, 1-1.5 m tall. Branches have scattered bristles. Leaves palmately divided into 3-5 leaflets. Leaflets are 1.5-7 cm long, 0.5-2 cm broad, commonly elliptic, toothed, upper surface almost hairless, lower surface with scattered starry hairs. Stipules are 3-10 mm long, threadlike. Leaf-stalk os 2-8 cm long, with a few scattered stiff hairs. Large pale-yellow flowers are borne singly in leaf axils. Flower stalks is 6-14 cm long. False sepals are commonly 10, 1.5-3.5 cm long, 1 mm broad, needle like, hairy, straight or slightly curved. Sepals are fused at the base, shorter than or equal to false sepals. Sepals are lance-shaped, long-pointed, 3-nerved. 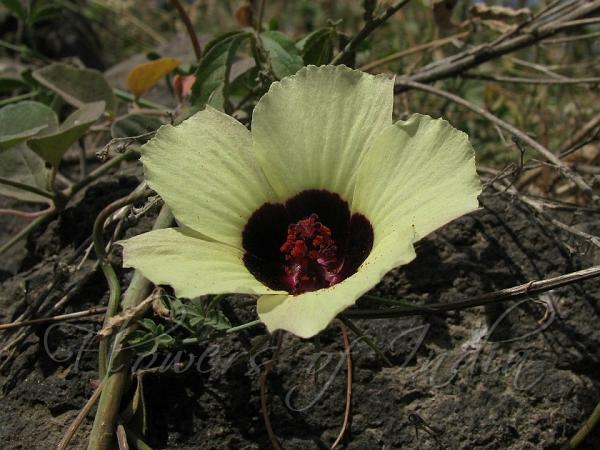 Flowers are 3-5.5 cm long, 5-8 cm across, yellow or rarely white with purple centre. Petals are obovate. Stamens column is 1.5-2 cm long, purple. Capsule is ovoid, 7-13 mm long, 6-9 mm across, beaked, covered with simple bristly hairs. Photographed at Daulatabad Fort, Aurangabad, Maharashtra.